Here is my old article from the OGR Forum that has long been deleted from it. Shows you how to make this specialty lighting for your layout. Hope you enjoy. Years ago on roadside stands, carnival amusements, gas stations to boardwalk amusements places you use to see those thick & "twisty" fluorescent tubes. Those were the old PG17 fluorescent tubes or also called "Power Groove". They were a HO (High Output) fluorescent tube you might have seen them in Cool White, Daylight & Yellow. When I was working for an electrical supply dist in Ocean County, NJ, I use to sell tons of these during the summer season for the seaside resorts. They are still used on the boardwalk, amusement parks, roadside stands and carnivals today. These old PG17 fluorescent tubes also came in 10? and 12. lengths that used sign ballasts to power them. For those who don't know a sign ballasts output goes off the total length of all the fluorescent tubes used in the sign. But anyway..
We have an inexpensive way to make to make these using parts from one of OGR's Forum sponsors and an item from your local dollar or party store! It is a simple project if you like to add fluorescent style lighting on the soffit of your hotdog stand, on a carnival ride or under a gas station canopy. Miller Engineering EL wire either with one of their Experimenter?s Kits or by the foot (If you are doing this by the foot, you will also need one of their #2701 Inverter to light the EL wire). Color can be your choice because people use to use tube cover on these bulbs for color to their stands. One bag of "Hot Rainbow Pick-Up Sticks". You can find these at most party stores and I have found them in almost ever little and chain dollar store in New Jersey and in NY & PA to so chances are they have them by you. You can also find similar on eBay, Toys R Us and other toy and discount stores. First, snip the end of one of the pick-up sticks. And then pull the color braiding out of the pick-up stick. It comes out real easy with no binding. 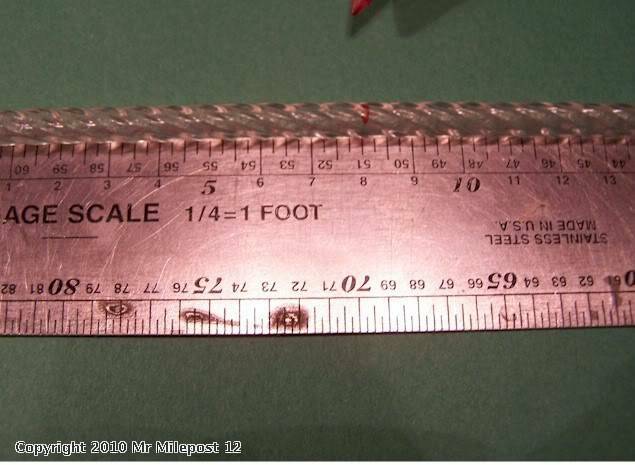 Next measure 8 scale feet for you PG17 fluorescent tube. These tubes are mostly F96PG17 in size (F96 for an 8? tube and PG17 for the dia and Power Groove tube body). These tubes also come longer (F120, F140, Etc) for signs and facades so you can make them longer if you wanted to. You can make them longer to if you are using this for cove lighting on an interior. And then cut the pick-up stick with your razor saw. Next take your pin vise with a 1/8" bit and from one side drill into the existing hole. 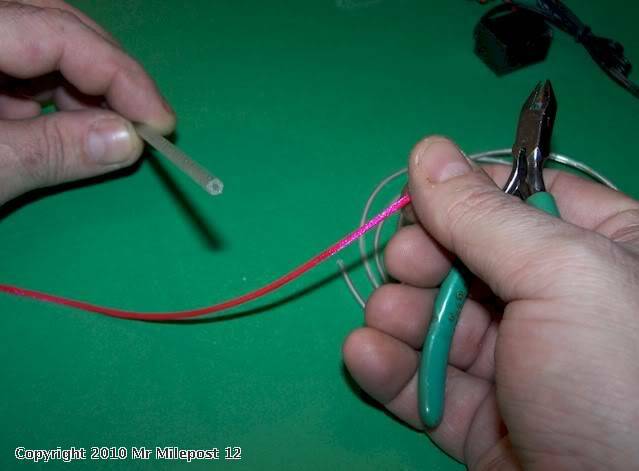 You need to bore out the hole to accommodate the EL wire, which is a tad wider. Back out the bit every so often so you can get the shavings out. Next go to the other hole and do the same so the bore goes right through the pick-up stick. Next use the pin vice with 3/32" bit to make sure the hole is clear through with no shavings inside the pick-up. You can use can air or an air gun to blow out pieces that might bind up. 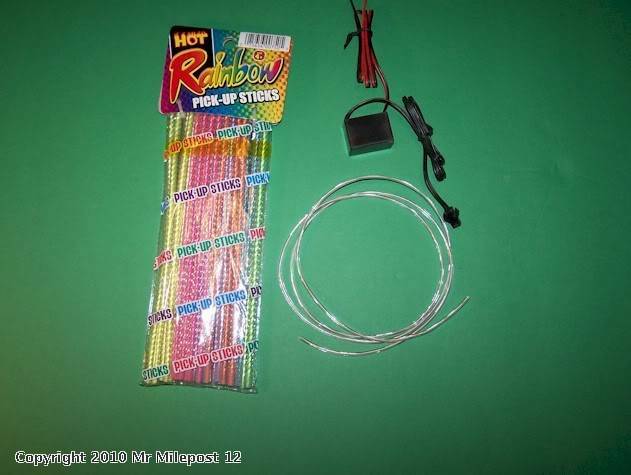 Next make your connections to the EL wire as per the directions included from Miller Engineering. 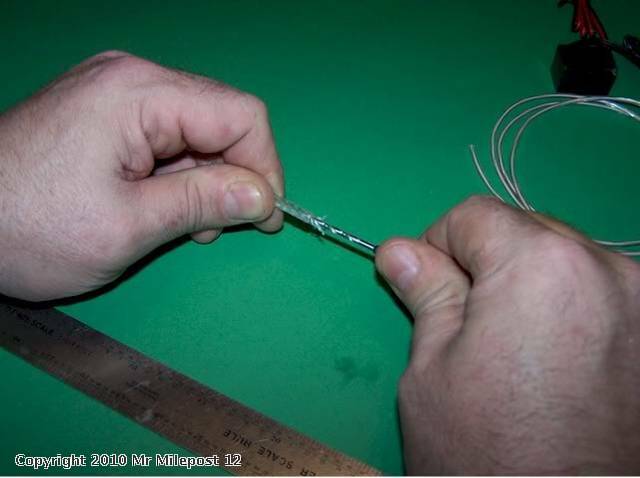 They are simple but take a bit of practice soldering because of very thin wires. The extra shrink tubing and wire will come in handy making multiple tubes. 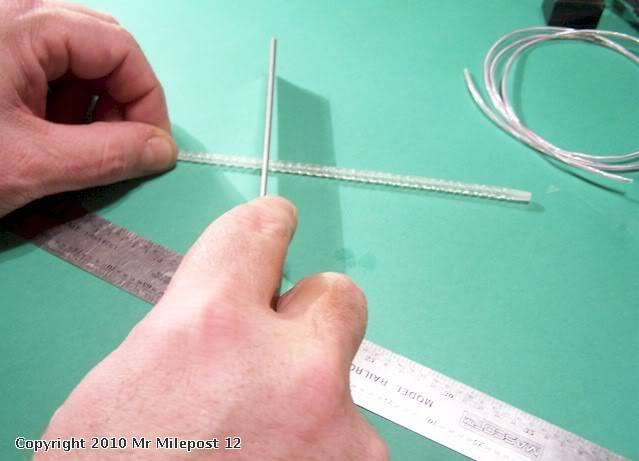 Remember to leave an inch on EL wire to the 8' scale length so you can make your connection. 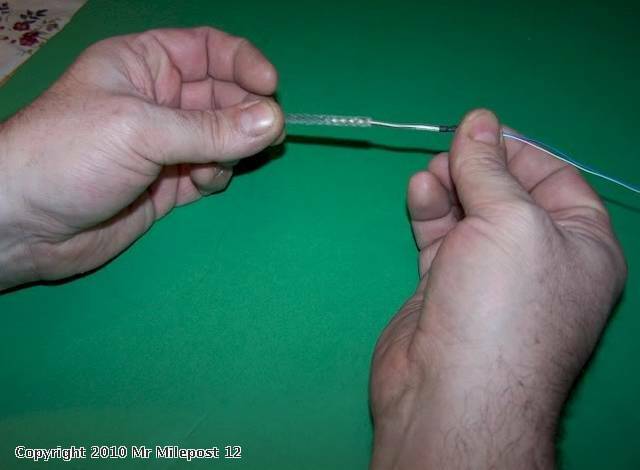 After you made your wire connections to the EL wire, slide it into the bored out pick-up stick right up to the shrink tubing on the wire. At the end of the stick without the wires, just put a dab of silicone on the end. This will protect you from that pesky "ZAP" you can get if you touch the end with the power on. Next, hook up the wires to the inverter as per the instructions, insert the batteries, and slide the switch and WA LA! You now have an O scale PG17 fluorescent tube ready for one of your buildings or rides. You can install it with CA or silicone. You can also make ends for the tube with balsa or basswood to give it a finish look of a waterproof fluorescent fixture. 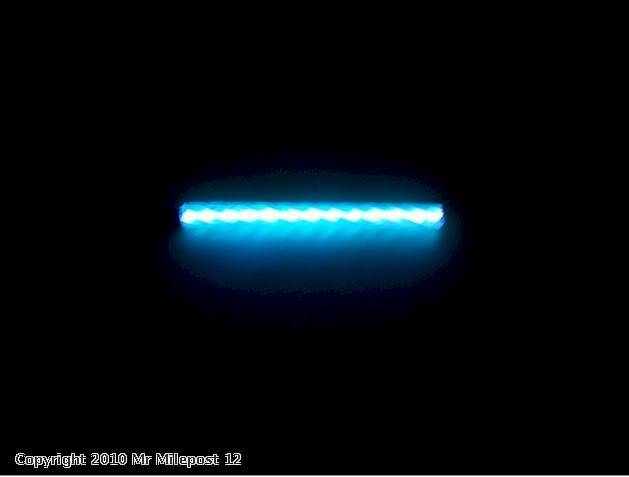 And will almost no heat generated by the EL wire it is safe. 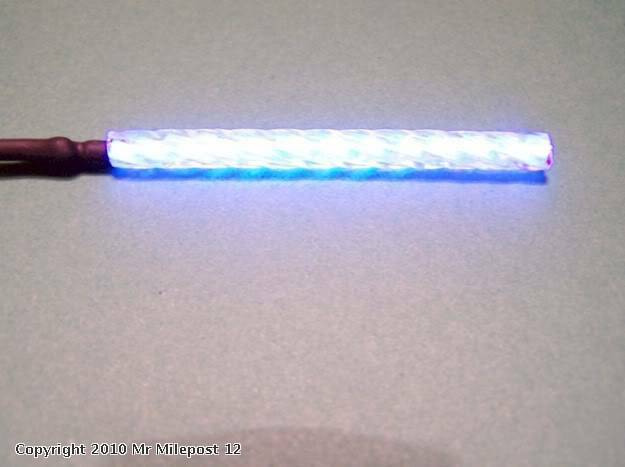 The Miller inverter can handle 6 to 10 feet of EL wire so you can make many and attach them to your converter. 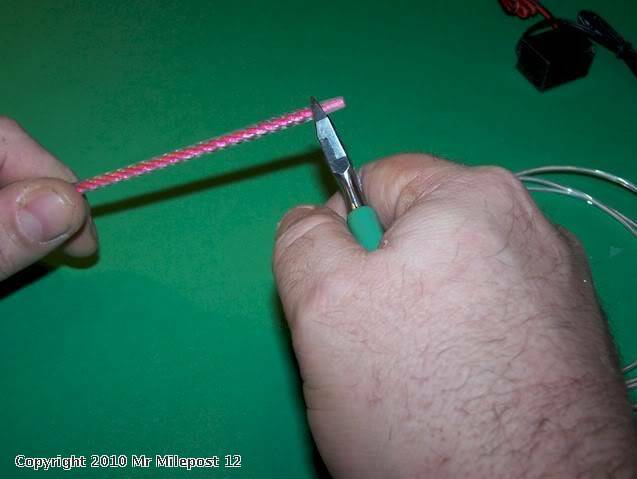 Also the pick-up stick acts like a parabolic and amplifies the light coming out of the EL wire! This is one way we use EL wire for lighting effects on the Schenectady and Wildwood Harbor buildings we been making for Don Klose as well as our own. Many of you been asking how we do some of our lighting and the ways we use the EL wire, well this is just one of many ways we use it. I am making a lot of these for some upcoming projects (Yes some are Don?s and some for the upcoming future Palace Amusements building). And when they are on finished buildings, I will post some here. I hope you find this little tutorial useful, any questions or comments just post away!